Welcome to Home Instead Senior Care. We invite you to join our network of more than 800 independently owned and operated franchises providing non-medical companionship and home care services to seniors around the world. 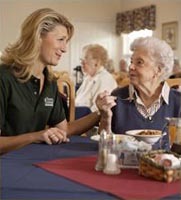 Our owners are individuals with a passion for helping seniors and a desire to make a difference. If you're looking for a business that has a powerful brand name, relatively low start-up costs, growth potential, unprecedented corporate support and a most gratifying career path, then read on. An innovator in eldercare since 1994, Home Instead Senior Care has quickly become one of the world's largest and most trusted names in the industry. We are proud to have created a caring Home Office culture and a successful systematic approach to help seniors live independently at home. This is truly a rewarding and meaningful business - one of the top reasons 20% of our franchisees own more than one Home Instead Senior Care location. By 2020, 60 million North Americans will be 65 years of age and older. 86% of seniors express the desire to continue living at home for as long as possible. While we have more than 800 franchises worldwide, the rising demand for senior services means there are plenty of territories available. Learn more about exciting franchise opportunities awaiting you with Home Instead Senior Care by completing and submitting the inquiry form below.